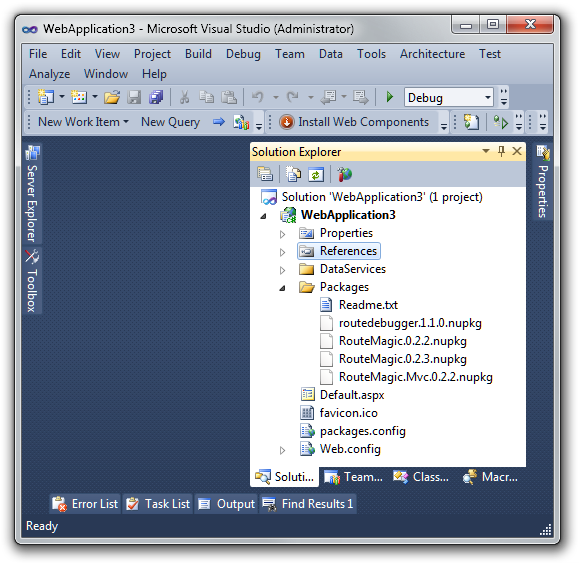 NuGet Server is basically a wrapper of the NuGet.Server package, but installed through a wizard. NuGet Server is distributed with its own web server, why you don't need IIS installed. A fully functional NuGet server you install as a Windows service. Purchase, download and double click the installer. Our wizard will guide you through the rest. To start serving your packages, simply place your NuGet packages in the Packages folder and start supporting NuGet in your company today! Bonus Alan Turing Code Offset! NuGet Server is a community project. While we can't provide a ton of support, if you have any questions or comments about NuGet Server, please contact us. 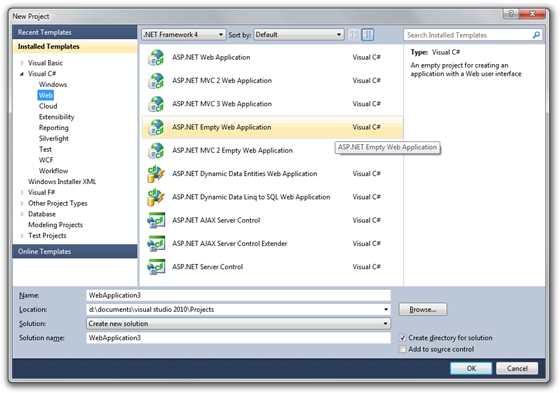 Go to the File | New | Project menu option (or just hit CTRL + SHIFT + N) which will bring up the new project dialog and select ASP.NET Empty Web Application as in the following screenshot. This results in a very empty project template. Now right click on the References node and select Manage NuGet Packages to launch the NuGet dialog (alternatively, you can use the Package Manager Console instead and type Install-Package NuGet.Server). 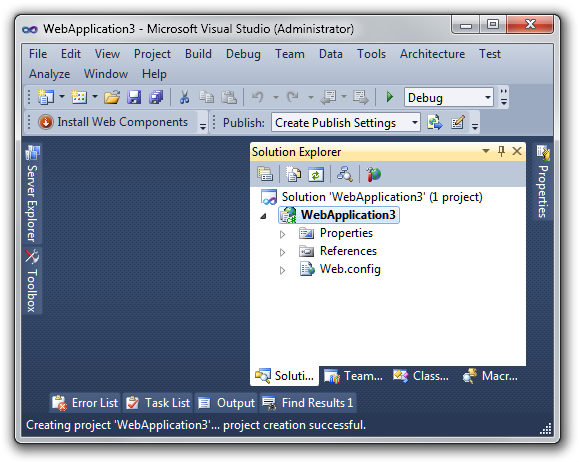 Click the Online tab and then type NuGet.Server in the top right search box. 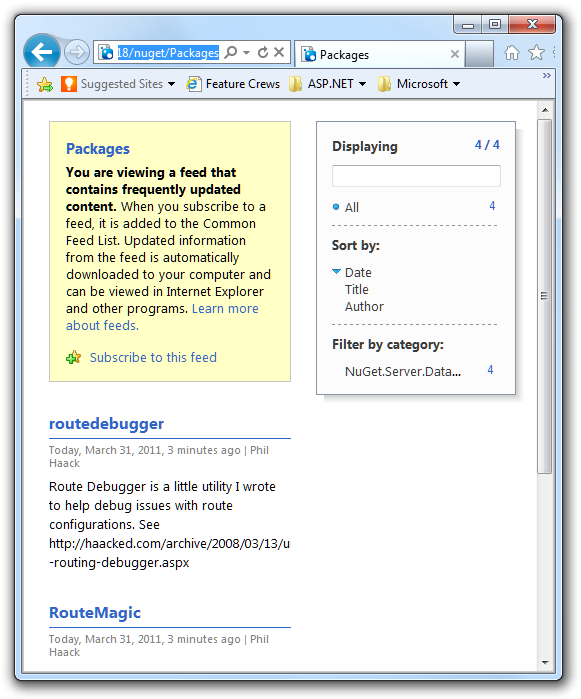 Click Install on the NuGet.Server package as shown in the following image. 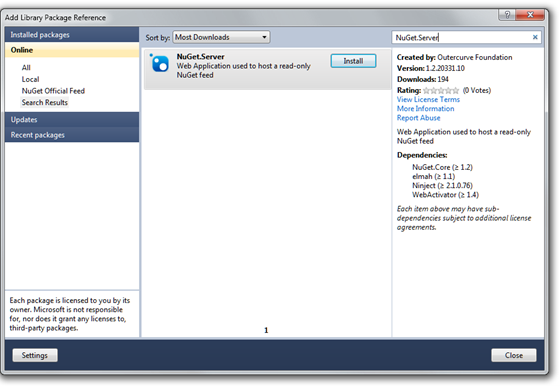 Starting with NuGet.Server 1.5, you can configure the folder which contains your packages. The web.config file contains a new appSetting, named packagesPath. When the key is omitted or left blank, the packages folder is the default ~/Packages. You can specify an absolute path, or a virtual path. That's it! The NuGet.Server package just converted your empty website into a site that's ready to serve up the OData package feed. Just add packages into the Packages folder and they'll show up. In the following screenshot, you can see that I've manually added a few packages to the default Packages folder. If you want these packages to be published (such as when selecting Build -> Publish from the application menu) you'll also need to select the .nupkg files in Solution Explorer and change the Build Action property to "Content". 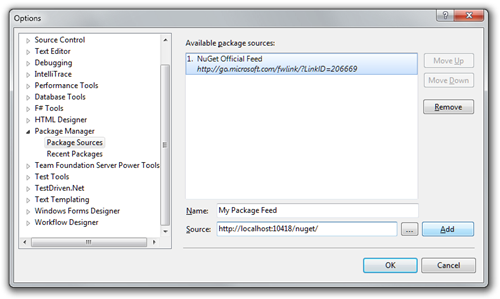 Starting with NuGet.Server 1.4, you can also add and delete packages to the lightweight feed using NuGet.exe. After installing the package, the web.config file will contain a new appSetting, named apiKey. When the key is omitted or left blank, pushing packages to the feed is disabled. Setting the apiKey to a value (ideally a strong password) enables pushing packages using NuGet.exe. If however your server is already secured and \ or you do not require an api key to perform this operation, set the requireApiKey value to false. Deploy and run your brand new Package Feed! I can hit CTRL + F5 to run the site and it'll provide some instructions on what to do next. Clicking on "here" shows the OData over ATOM feed of packages. Now all I need to do is deploy this website as I would any other site and then I can click the Settings button and add this feed to my set of package sources as in the following screenshot. Note that the URL you need to put in is http://yourdomain/nuget/ depending on how you deploy the site. Yes, it's that easy! An alternative way of publishing packages to this server is by simply placing the nupkg under the the Packages folder and they are automatically syndicated.